(Updated March 20) The 'March 2017 Nutritionist Dietitian board exam results' to include the list of passers, top 10 (topnotchers), top performing schools and performance of schools are released online on Monday, March 20 or in 2 working days after the exam. UPDATE: 755 out of 1,047 passed the exam, PRC announced. The Professional Regulation Commission (PRC) administered the re-set of Nutritionist-Dietitian licensure exam on March 15 and 16 in the cities of Manila, Baguio, Cebu, Davao and Zamboanga. Pursuant to PRC Resolution No. 1021, Series of 2016, the March 2017 exam was scheduled after the required quorum to administer the licensure examination. The supposed 2016 exam was completed through the appointment of Ms. Imelda A. Agdeppa and Ms. Rhoda Joy Ramos-Buenviaje as new Members of the Board of Nutrition and Dietetics by President Rodrigo Roa Duterte. Aside from Agdeppa and Buenviaje, other member of the Board of Nutrition and Dietetics who gave the licensure examination was Virgith B. Buena, the Chairman of the Board. The two-day exams covered nutritional biochemistry and clinical dietitics (35%) and community and public health (30%) on Day 1; and another 35% for foods and food service systems on the second day. PRC said that to pass the examinations, a candidate must obtain an average of 70%, with no rating below 50% in any subject: Provided, that an applicant who fails to obtain a passing average but who obtained at least seventy percent in each of at least one-half of the total subjects given in the examinations, may be permitted to take within one (1) year from the date of his examination, another examination, on the subjects in which he obtained a grade below seventy percent. Should the examinee fail in the set of subjects repeated in the second examinations, he/she shall be required to take all the subjects in the next examinations, PRC said. In August 2015 exam, PRC has released results in 2 working days after the tests. A total of 705 out of 1,089 passed with University of the Philippines (UP) - Los Banos grad topped the exam. During the July 2014 licensure exam, results were released online also in 2 working days. PRC named 634 out of 997 who have passed the exam. UP-Diliman alum managed to get the highest place. 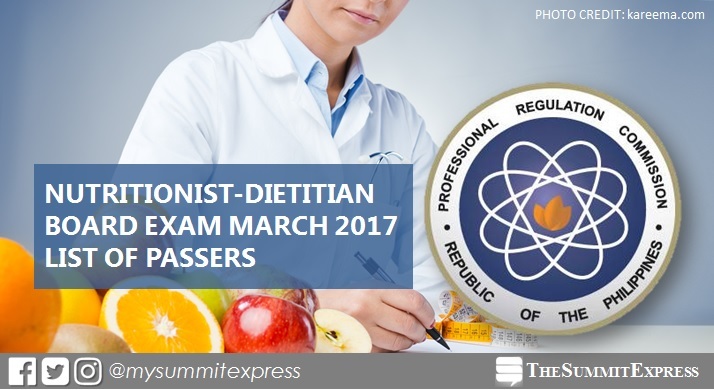 According to PRC Board News, the March 2017 Nutritionist Dietitian board exam results are out expected on this Monday, March 20 or in 2 working days after the exam. SUMMARY: Nutritionist Dietitian board exam results in the past three years. From March 27 to March 29, 2017, registration for the issuance of Professional Identification Card (ID) and Certificate of Registration will be done on-line. Please go to www.prc.gov.ph and follow instructions for initial registration. PRC advised that successful examinees should personally register and sign in the Roster of Registered Professionals. Nutritionist Dietitian board exam verification of ratings (passers, non-passers and removal) can be done online. Visit PRC's "Verification of Rating" service and enter the required information to verify your identity. Note that this can be available in few days after the exam. The Summit Express will update this page immediately once results are out online.